To explore the mind of somebody incredibly wicked gives us some sort of perverted pleasure. Sorry but I’ve got to raise Commodus here. If what you were saying were true, we should bloody love Commodus, given that he’s one of the most wicked (and most perverted) characters ever portrayed on screen. Instead, I don’t know anyone who likes him. Don’t get me wrong. When you talk about a group of variables like this there’s an unspoken understanding that it doesn’t apply to all cases. Obviously not all villains are more liked than their protagonist counterpart. That would be arbitrary statistically improbable. The point I’m making is that villains have more potential. A writer can choose to two-dimensionalise a villain to play the standard bad guy, but because the villain is not bound by any expectations or ethical guidelines, the complexity of the character is limitless. No, I understand you. I know you weren’t saying that we always like the villain more than the protagonist. Statistics aside, most films would fail if this were the case, since we’d be rooting for the wrong guy. 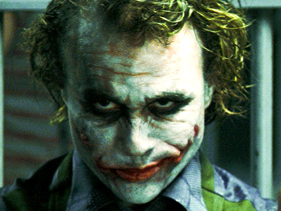 My point is just that characters like the Joker have a sort of mental and social power that guys like Commodus lack. Our liking of these powerful characters comes from an admiration of their ability. Indeed, I think there’s some truth to what you said: that we enjoy the lack of ethical regulation in villains. It just seems odd to ignore the power that they often exhibit. Very interesting read. I’m not sure if anyone’s mentioned it yet, but I’m pretty sure the case you mentioned with the artist and the people who were allowed to do whatever they wanted was Marina Abramovic’s “Rhythm 0”. Thanks very much for mentioning the artist! Was very difficult for me to remember the case.